How do I change the status of a submission in the New Gradebook? 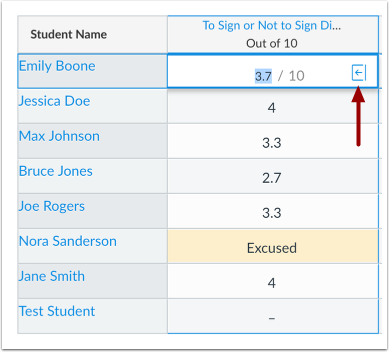 As needed, you can use the Grade Detail Tray to change the status for an assignment, discussion, or quiz submission. Available statuses include late, missing, excused, or none (no status). You can also change the status for a group assignment. Assignments with a late or missing status will display a label on the student's grades page indicating the status. 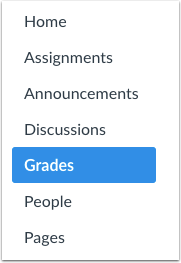 If you do not want status labels displayed on a student's grades page, set the assignment status to None. 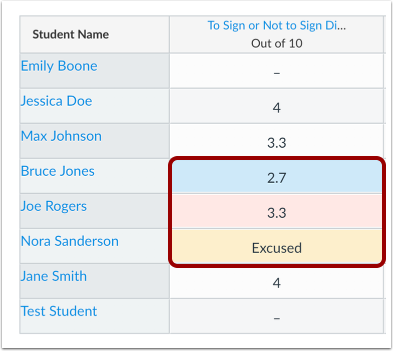 Excused assignments are not calculated as part of a student's total grade. 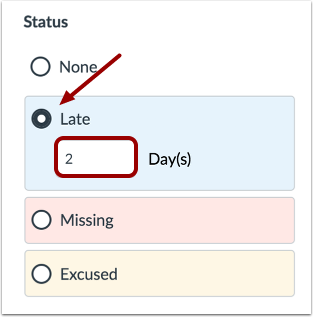 Currently, points are not automatically deducted for assignments with a late status. When an assignment is excused, the assignment page and the student grade page will show the student that he or she has been excused from the assignment. Students cannot submit excused assignments. Note: You can change the status colorsfor each status in the Gradebook; however, you cannot change the status names. Locate the student name and assignment where you want to change the status. Click the Gradebook cell and click the Grade Detail Tray icon. 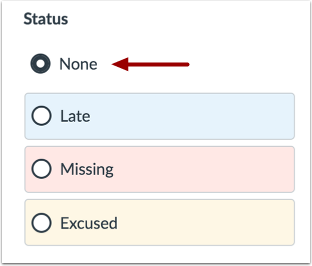 The Status section of the Grade Detail Tray displays available status options. Any selected status is applied immediately. Depending on the assignment's settings and student submissions, a status may already be selected for you. Note: Color status is only visible in the Gradebook and does not affect the student Grades page. To select no status, click the None radio button. The None status indicates that no status exists, or that the assignment was turned in before the due date. You can also update any late or missing assignment to have no status if you do not want a label displayed in the student's grades page. To select a Late status, click the Late radio button. The Late status indicates an assignment that was submitted after the due date. You can enter a number of how many days late the student submitted the assignment. Note: Currently, the Late field is for reference only and has no effect on the student's grade. 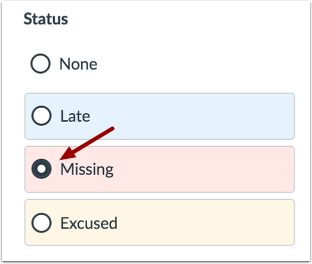 To select a Missing status, click the Missing radio button. The Missing status indicates an online assignment that has not been submitted and is past the due date. 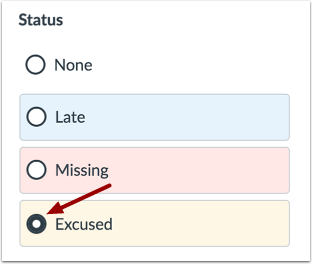 To select an Excused status, click the Excused radio button. The Excused status indicates that the student has been excused from making a submission. Students are not able to submit excused assignments, and excused assignments are not calculated in the student's total grade. You can also excuse an assignment by typing EX in the assignment cell. Assignment cells in the Gradebook will display the color assigned to the corresponding status. The student grades page will display a label corresponding to the status setting in the Gradebook. Labels will display for late assignments  or missing assignments . Excused assignments are noted by EX in the points column. Assignments with no status (none)  do not display a label in the Status column of the student grades page. Previous Topic:How do I send a message to students from the New Gradebook? Next Topic:How do I download all student submissions for an assignment in the New Gradebook? Table of Contents > New Gradebook > How do I change the status of a submission in the New Gradebook?